Track loaders provide the ideal combination of the power and versatility required for digging, pushing, loading and transporting materials over rough ground and in confined spaces. Caterpillar® manufactures a line of hard-working, peak-performing track loaders for all types of general earthmoving applications, along with specific models designed for waste and port handling. All Cat® track loader models are engineered and built to take on the biggest jobs and deliver the legendary reliability that has been a Caterpillar staple for nearly a century. Call us today at (317) 803-2526 for more info on track loader rentals. Looking for smaller track loader rentals? Visit MacAllister Rentals for small track loaders. If you’re looking for a track loader on a temporary-basis, Indianapolis-based MacAllister Machinery can help. 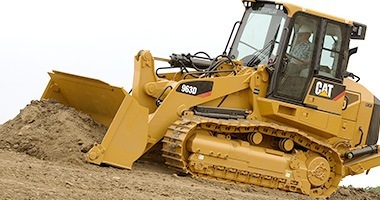 As an authorized Cat equipment dealer, we can provide a large track loader rental from the worldwide heavy equipment leader that offers an economical alternative to buying a new or used machine. You’ll also have the peace of mind of knowing you’re renting from a company that has been serving the region’s equipment needs since 1945. What Do You Get With a Track Loader Rental From MacAllister Machinery? When you rent a large track loader from us, you’ll get a late-model, low-hour machine that’s ready for immediate pickup or delivery, allowing you to keep your project on schedule. All our rental units undergo a comprehensive multi-point inspection process to ensure they’re in peak operating condition. If an unexpected mechanical issue occurs, our field service technicians are available on a 24/7/365 basis to come to your job site and perform prompt repairs. Our knowledgeable rental equipment staff will work with you to find a flexible rental agreement that meets your requirements and budget whether you’re looking to rent a track loader for a day, week, month or longer. When a machine that’s vital to your company’s productivity breaks down, a rental from MacAllister Machinery will provide a fast replacement to minimize unproductive downtime. Renting can also help you avoid some of the costs that come with equipment ownership such as maintenance, repairs and storage. When you rent late-model heavy equipment, you will have access to some of the most advanced technological features on the market that can increase job site productivity and efficiency. And renting enables you to take a track loader you’re thinking of purchasing for a “test drive” as part of your evaluation process. MacAllister Machinery has served the region with distinction for more than 70 years. We’ve established a stellar reputation for providing the best, most reliable machines backed by world-class customer service and support. 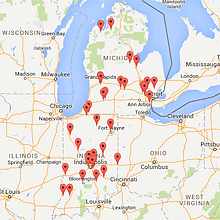 We also have convenient locations throughout Indiana to serve you. You can rent from us with total confidence. Please take a minute to review the current track loader rental inventory found in our heavy rental product guide. Feel free to contact us for more product information and a no-obligation quote.